This kind of congenital heart defect involves the incomplete development of the central tissues of the heart, which are collectively known as the Endocardial Cushions. These tissues normally contribute to the separation of the chambers of the heart during fetal development. The upper chambers (atria, singular atrium) are separated by a muscle wall (septum) known as the atrial septum. The lower chambers (ventricles) are separated by a muscle wall known as the ventricular septum. 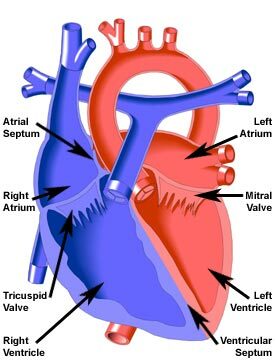 The right atrium is separated from the right ventricle by the tricuspid valve, and the left atrium is separated from the left ventricle by the mitral valve (see diagram).